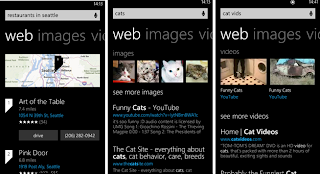 A new version of bing windows phone 8 search engine application has been rolled out by Microsoft which includes new looks and more enhanced features. The new updates which adds new search result categories plus improved image and video search features will be available across the US this week. 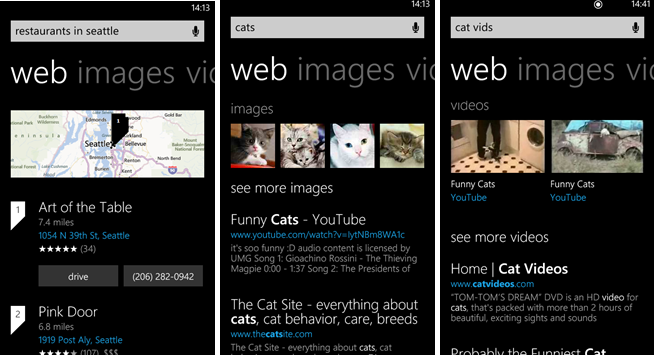 "The new Web category, for example, is designed to be smart enough to show whatever’s most relevant to your search, including images, videos, and local results (check out the screenshots below). “We’re gonna put more info on your first search result screen,” Saydalikhodjayev says. This also means less swiping on your part, he notes. The Bing team has also worked to improve the freshness of the service’s local results and made it easier to get things like directions and phone numbers for local businesses."